BA cabin crew members had planned to walk out for a total of 20 days in a dispute over pay and working conditions. 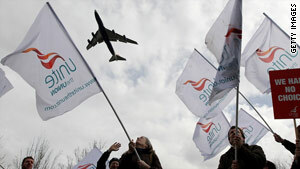 London, England (CNN) -- A British Airways employee strike planned for midnight Monday (7 p.m. ET) cannot proceed, a judge has ruled. A London court granted an injunction preventing the strike by members of Unite, the union representing British Airways cabin crews. The first strike in the series had been scheduled to last through Saturday. The injunction prohibits the strikes, barring a successful appeal. "We are delighted for our customers that Unite's plans for extreme and unjustified strike action cannot go ahead," the airline said in a written statement. "We are sorry the court judgment cannot undo the disruption already suffered by some customers who were due to travel during the early days of the union's industrial action." BA cabin crew members planned to walk out for a total of 20 days because of a long-running dispute with the airline over pay and working conditions. The crew members went on strike over the issues twice in March but have since failed to resolve the dispute with their employer. Unite, which represents 95 percent of British Airway's 15,000 cabin crew members, said they were left with no choice but to strike again. "As Unite knew, we had to announce last Thursday the rearrangement of our Heathrow schedule to give customers as much notice as possible about changes to their travel plans necessitated by the strike call," British Airways said. "Ash disruption permitting, we will aim to restore a full flying programme at Heathrow by the weekend. We will also operate a full programme at Gatwick and London City, as planned." In seeking the injunction Friday, British Airways said it believes Unite failed to comply with laws on how strike ballots should be conducted. "We make no apology for looking at every option possible to protect our customers and our company from this completely unjustified strike and the union's cynical attempts to destroy our airline," it said. On Monday, the airline said, "We hope all sections of Unite ... will take this opportunity to pause and focus on achieving the early and peaceful end to this dispute, which the traveling public and all our employees want." The airline had said it hoped to fly about 70 percent of its customers during the first strike by leasing aircraft and crews and using employees who cross picket lines. The other strikes were planned for May 24-28, May 30-June 3, and June 5-9, Unite has said. They were set to end just days before the start of the World Cup soccer tournament in South Africa.